Utilizing engineered green wood products, high efficiency heating and cooling systems, hot water systems, super insulated structures and low-VOC building materials allows us to build your project better, cleaner, more energy smart and environmentally friendly than using traditional methods. What are low VOC building materials? Volatile organic compounds (VOCs) and other hazardous chemicals are contained in many construction materials and furnishings, posing a risk to the general population, especially children. Today a number of low and no VOC building materials are available, including less polluting paints, adhesives, solvents, cleaning agents, caulks, wood products, carpets and sealants. Cleaner indoor air quality can be realized by simply using low VOC building materials. 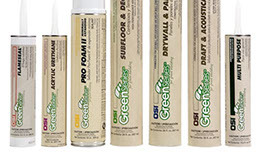 We have included some of the green products we use on many of our green projects here on this page as well as links to the manufactures web sites on our products page.